The Dons boss was delighted as his side took another stride forward in the Scottish Cup. 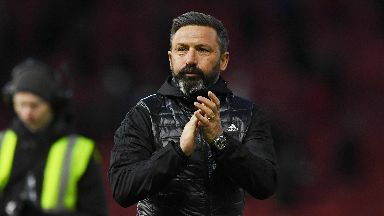 Aberdeen manager Derek McInnes hailed his players for their second half showing as they defeated Queen of the South 4-1 to reach the last eight of the Scottish Cup. Inspired by Niall McGinn, who came off the bench to score the opener and set up two goals, the Dons continued their impressive cup form of recent years. McInnes gave credit to Queen of the South for their performance, which included a wonder goal from Stephen Dobbie, but said his players showed the right attitude to prevail. "I'm very pleased to get through," he said. "It wasn't straightforward, and that's credit to Queen of the South, Gary's got them going well. They came up with loads of belief but we were looking for more intensity. "We defended well for most of the game and kept their front two at bay for the most part - other than the brilliant strike from Stephen Dobbie. "I felt at half-time that it was important we recognised we had work to do. We had to bring more speed and drive to the second half, and I think it was almost the perfect second-half performance. "McGinn comes on and makes a contribution - a goal with almost his first touch, and a couple of assists. "We had a striker here for many years in Adam Rooney who would always hit the 20-goal mark, and what Sam's doing is testament to his hard work. "He's listening, improving, and he looks a proper centre-forward. I do joke with him that if he hadn't waited until November to start scoring we might be top of the league by now." Doonhamers boss Gary Naysmith said: "I think 4-1 was a little bit harsh on the players, and I'm led to believe the penalty should never have been, although I've not seen it back. "Over the piece Aberdeen deserved to win but we more than matched them over 60 minutes. They got their first goal and we scored a fantastic goal ourselves and it was unfortunate we couldn't build on that. "They scored two goals pretty quickly, and 3-1 is hard enough. When it goes to 4-1 you start to worry it could get heavier, but credit to the players, they kept going and fighting away. We were playing a top, top team. "I've nothing but praise for the players and we need to take the positives and move into the game against Dundee United next week."